Wrongfully accused and on the run, a top MI6 assassin (Mark Strong) joins forces with his long-lost brother (Sacha Baron Cohen) to save the world from a sinister plot. MI6’s top assassin (Mark Strong) has a brother. Unfortunately for him, he’s an English football hooligan (Sacha Baron Cohen) from the town of Grimsby. 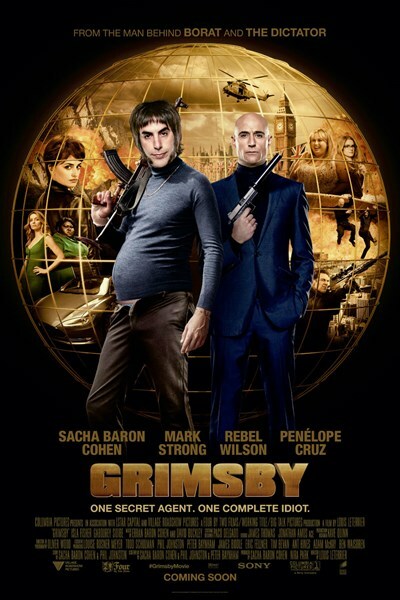 Nobby has everything a man from the poor English fishing town of Grimsby could want – 9 children and the most attractive girlfriend in northern England (Rebel Wilson). There’s only one thing missing in his life: his little brother, Sebastian. After they were adopted by different families as children, Nobby spent 28 years searching for him. Upon hearing of his location, Nobby sets off to reunite with his brother, unaware that not only is his brother an MI6 agent, but he’s just uncovered a plot that puts the world in danger. On the run and wrongfully accused, Sebastian realises that if he is going to save the world, he will need the help of its biggest idiot.